Dan Callen and Matthias Schulze, Coherent Inc.
A laser-scanning fiber endoscope uses a plug-and-play laser combiner to enable high-contrast images suitable for detecting early-stage precancerous lesions. Detection of early cancerous lesions using molecular imaging can improve disease diagnosis and increase survival rate – this is well established. For example, fluorescently labeled antibodies can be combined with laser excitation in various types of imaging endoscopes to deliver images highlighting precancerous tissue. This can enable real-time in vivo screening by allowing the endoscopist to identify areas for testing and/or excision. However, the presence of strong autofluorescence (AF) can seriously limit image contrast and make this identification difficult, if not impossible, in some instances. Now, a team of researchers at the University of Washington has successfully demonstrated that using multiple laser wavelengths simultaneously can eliminate most of the AF background problem in studies targeting high-grade dysplasia (HGD) cells in human esophageal tissue. A key enabling component in their scanning fiber endoscope (SFE) is a completely new type of plug-and-play fiber combiner that allows up to eight laser wavelengths to be efficiently deployed in a stable manner in just a few minutes, rather than the many hours normally required from a highly skilled optical technician. “In this particular study, we have used fluorescein-labeled antibodies to target cell membrane proteins such as EGFR, ERBB2 and C-Met in a molecular imaging diagnostic scheme that is specific for high-grade dysplasia cells in esophageal tissue associated with Barrett’s esophagus,” said Chenying Yang, a Ph.D. candidate in Seibel’s research group. “Without mitigation of the strong background autofluorescence, the limited contrast typically makes it difficult, and often impossible, to obtain usable tissue-specific data from the fluorescently labeled images (Figure 1). And looking forward to possible future clinical use, where it is not possible to quantify the relative fluorescence intensity of targeted biomarkers, then the endoscopist simply would not be able to perform red-flagging and biopsies of targeted tissue. The researchers successfully investigated a solution using two different laser wavelengths: 445 and 488 nm. The 488-nm wavelength was chosen to match the absorption maximum of the target fluorophore (fluorescein), but they knew from previous studies that it would also excite broadband autofluorescence (Figure 1). The 445-nm wavelength was chosen to be far enough away from the fluorescein absorption band, but close enough to 488 nm to generate only autofluorescence that presumably has a spectral profile similar to the AF excited by the 488-nm laser. They confirmed this assumption in a separate study by dispersing autofluorescence excited at these two wavelengths using tissue samples that had not been treated with fluorescein. They also showed that any part of the observed tissue field that produced strong spurious specular reflections would be similarly reflective at both 445 and 488 nm.3 This led them to reason that subtracting an appropriately scaled 445-nm excited AF image from the 488-nm excited image should eliminate both the AF background and the specular reflectance background, yielding an image containing only fluorescence from the fluorescein-tagged HGD cells excited by the 488-nm laser. Figure 2 is a schematic illustration of the SFE that the UW team developed. Light beams from three Coherent OBIS FP lasers at 445, 488 and 640 nm are combined in an OBIS Galaxy plug-and-play beam combiner. The combiner’s single-mode output is then connected to the single-mode illumination-delivery fiber in the SFE. At the distal end of the endoscope, a piezo tube actuator deflects a scanning fiber across the field of view. Why three wavelengths? The 640-nm channel will be used for an additional level of real-time biomarker quantification, as the red reflectance imaging channel provides a means for adjusting the biomarker’s fluorescence pixel values for the distance from the endoscope.1 Thus, a three-channel imaging endoscope can more accurately guide the doctor to taking a biopsy of the most dangerous tissue, while also providing anatomical information when fluorescence is absent. The researchers then demonstrated the efficacy of this novel AF-mitigation algorithm on a tissue phantom grown to simulate an esophagus with regions of HGD cells.7 Specifically, digested bovine collagen was reconstituted as a gel to form a support matrix, which was seeded with an HGD Barrett’s esophagus cell line. This was then molded into a tubular 3-D structure to roughly simulate the shape of a real esophagus. 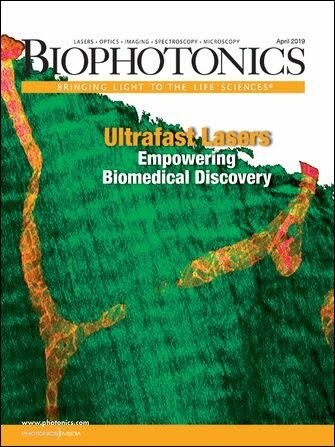 As with many other multiwavelength applications in bioinstrumentation (e.g., cytometry and microscopy), combining multiple lasers into a single optical fiber was one of the biggest practical challenges in successfully building this multiwavelength SFE. There are two aspects to the well-known challenge of delivering multiple lasers via a single fiber. First is the basic question of coupling a laser into a single-mode fiber. Many instruments, including this endoscope, must use polarization-preserving single-mode fiber, which has a core diameter of only 3.5 µm. Efficient coupling of a laser into such a small fiber core necessitates optimization in up to 6° of adjustment (X, Y, Z and three rotational angles) at submicron precision. It also can take several hours, even for an experienced technician. Moreover, these adjustments can drift over time because of thermal or mechanical effects, which is why permanently aligned pigtailed modules such as the OBIS FP series from Coherent have been an important advance for instrument builders. Figure 4. The OBIS Galaxy optical bus uses eight wavelength-dedicated plug-and-play input sockets to combine multiple lasers in a single output fiber. Courtesy of Coherent. In instruments with multiple lasers, the situation is much more complex − accordingly, combining multiple lasers into a single fiber has traditionally been one of most challenging optomechanical tasks in biophotonics. Typically, this has been done in a serial manner using macroscopic, collimated beams: adding a second laser, then a third and so on. This necessitates the cost and complexity of dichroic beamsplitters, polarizers and wave plates at each successive laser wavelength. Then the collinear beams have to be carefully coupled into the output delivery fiber. Moreover, the optical characteristics of the dichroic coated optics are very angle dependent and can result in significant losses. Plus, the numerical aperture (NA) of conventional fiber varies with wavelength. The end result is a typical maximum optical throughput of around 30 percent per laser. This optical hurdle is in complete contrast to the computers and smart devices that make up the electronic part of biophotonics, where USB and Firewire plug-and-play functionality have long since made the soldering iron a relic in most labs. A completely different type of beam-combining module − the OBIS Galaxy − brings the same plug-and-play functionality and flexibility to fiber-coupled lasers that USB and other bus technologies brought to computers and smart electronics (Figure 4). It also preserves single-mode output and linear beam polarization, requires no mechanical adjustments whatsoever and is completely passive (i.e., does not use any electronics). And, like USB, this patented module is designed to function as an open-access architecture using standard available fiber connectors (FC/UFC), so that it can be used with any fiber-coupled laser that meets the requisite performance levels in the areas of beam quality, and wavelength fidelity and stability. Figure 5. OBIS Galaxy. Courtesy of Coherent. As can be seen in Figure 4, the eight wavelength-dedicated laser input sockets use the latest FC/UFC connectors that feature maximum optical registration precision. Each input is then collimated as a macroscopic beam using a rigidly mounted lens before all these collimated beams are integrated in a single monolithic glass element. The light is then coupled into the output fiber that terminates in an FC/APC connector to enable simple connection into an experiment or instrument. The laser inputs span the visible spectrum and include legacy wavelengths such as 488, 514 and 532 nm, as well as the relatively new yellow wavelengths (552 and 561 nm) enabled by optically pumped semiconductor laser technology. And because the combiner uses a refractive optic strategy to combine up to eight different laser inputs, as well as a proprietary output fiber whose NA is independent of wavelength, the performance of this device is both efficient and stable; throughput is up to 75 percent for each laser. Dan Callen is product manager at Coherent Inc. of Santa Clara, Calif.; email dan.callen@coherent.com. Matthias Schulze is director of marketing for OEM components and instrumentation at Coherent Inc.; email: matthias.schulze@coherent.com. 1. C. Yang et al (2013). Color-matched and fluorescence-labeled esophagus phantom and its applications. J Biomed Opt, Vol. 18, No. 2, p. 026020. 2. S.J. Miller et al (2012). Targeted detection of murine colonic dysplasia in vivo with flexible multispectral scanning fiber endoscopy. J Biomed Opt, Vol. 17, No. 2, p. 021103. 3. C. Yang et al (2014). Multispectral scanning fiber endoscope with concurrent autofluorescence background mitigation for improved target-to-background ratio. Proc SPIE, 8927-18. 4. C. Yang et al (August 2013). Mitigating fluorescence spectral overlap in wide-field endoscopic imaging. J Biomed Opt, Vol. 18, No. 8, p. 086012. 5. C.M. Lee et al (June 2010). Scanning fiber endoscopy with highly flexible, 1-mm catheterscopes for wide-field, full-color imaging. J Biophotonics, Vol. 3, No. 5-6, pp. 385-407. 6. C. Yang et al (2014). Scanning Fiber Endoscope with multiple fluorescence-reflectance imaging channels for guiding biopsy. Proc SPIE, 8936-27. 7. V.W. Hou et al (2014). The development of a simplified epithelial tissue phantom for the evaluation of an autofluorescence mitigation algorithm. Proc SPIE, 8945-5. 8. V.W. Hou et al. J Biomed Opt (in press).